Dr. Sigafoos, our in-house periodontist, provides expert gum disease treatment using minimally invasive procedures. Gum disease is the leading cause of tooth loss in American adults over 35. Fortunately, it’s preventable with regular professional cleanings and proper home care. Our team is well-equipped to treat gum disease thoroughly and comfortably, even in advanced cases. We treat mild, moderate and severe gum disease using a combination of state-of-the-art techniques, including gentle ultrasonic scaling for deep cleaning and minimally invasive laser therapy to remove diseased tissue and disinfect the gums. 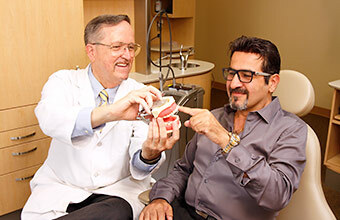 Our doctors emphasize patient education in their approach to treating gum disease. 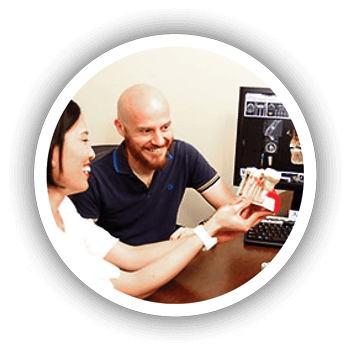 You will receive a detailed explanation of your specific circumstances, and during every appointment, time will be set aside to go over tailor-made home oral care instructions with you. Dr. Gary Sigafoos is our in-house periodontist, a dental expert who specializes in treating diseases of the gums and other tissues that support and surround the teeth. 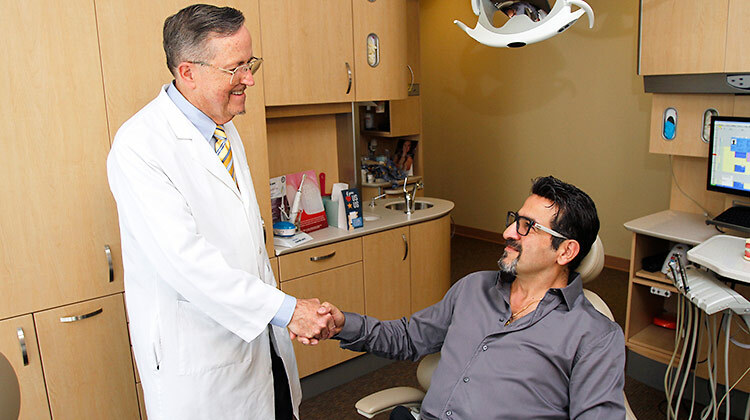 He takes care of our patients who are in need of advanced gum disease treatment. Dr. Sigafoos has over 30 years of experience in periodontics. He is a highly trained specialist who has given many lectures and presentations to other dental professionals on different aspects of gum disease treatment. Dr. Sigafoos, like the rest of our team, is a great communicator. He takes the time to clearly explain periodontal disease and treatments. 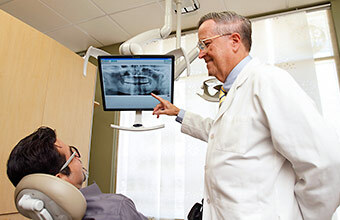 He takes an educational approach to gum disease therapy, so patients can do their part in eradicating the condition and maintaining their oral health in between visits. 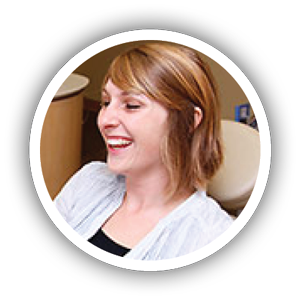 Dr. Sigafoos will asses the condition of your gums and go over treatment options with you in detail. To evaluate the condition of your gum disease, we will gently probe the gum pockets (the space between your teeth and gums) to accurately measure and chart the depth of each pocket. Healthy gums are firm, pink, do not bleed easily and are not receding. They hold the teeth firmly in place, and there is no underlying damage to the supporting bone tissues. Gingivitis, inflammation of the gingiva (the gums), is the mildest form of gum disease. The gums at this stage are red and swollen and bleed easily. There is usually little or no discomfort at this stage. Gingivitis is caused by the accumulation of plaque, a film of bacteria, on the teeth and can be treated easily with a professional cleaning and good oral home care. Moderate gum disease is characterized by pocket depths of four to five millimeters and some (but very little) bone loss. It is treated with a deep cleaning, a process of cleaning (scaling) below the gum and smoothing the surface of the tooth root (planing) to prevent bacteria from sticking to those surfaces and to allow the gums to reattach. An antimicrobial oral rinse will be used to further eliminate any bacteria from the gums. The doctor will also use a soft-tissue laser to remove infected gum tissue. Severe gum disease is characterized by multiple pocket depths of five millimeters or greater and more extensive damage to bone tissues. The most advanced form of periodontitis includes extensive bone loss, and oftentimes teeth become loose and may have to be removed. Treatment for severe gum disease begins with a deep cleaning below the gumline and a soft-tissue laser to disinfect the pocket. Dr. Sigafoos will perform bone grafting and gum grafting as necessary to correct bone and gum loss. He may also perform flap surgery to resolve persistent cases and to treat very deep pockets. 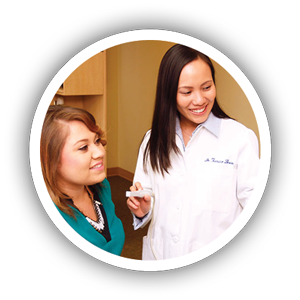 Our doctors will thoroughly explain every step of your procedure before treatment. Depending on your individual circumstances, the doctors may employ one or more of the following methods to treat your gum disease, in addition to providing thorough education and a customized home care plan. An ultrasonic scaler produces sound vibrations to gently remove plaque and tartar. The sound vibrations destroy the cell membranes of the gum-disease-causing bacteria, thereby killing them, and the sound waves also assist in breaking up hard tartar deposits. Additionally, ultrasonic scalers release a flow of water that flushes away debris and bacteria, promoting faster healing. They are more comfortable for patients than traditional hand instruments. 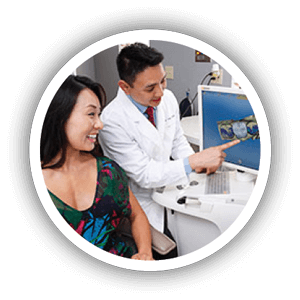 Precise dental lasers gently remove diseased tissue, leaving healthy tissue intact, and disinfect the gum pockets without the need for cutting and sutures. The laser also cauterizes as it proceeds. The result is minimal patient discomfort and faster healing. The doctors may use ARESTIN® therapy to treat a localized infection. This gel contains tiny microspheres filled with a powerful, timed-release antibiotic. It is used to help eliminate any localized bacteria that may remain after a scaling and planing procedure. In some cases, the doctors may perform DNA testing to determine the best systemic (whole-body) antibiotic treatment to combat your periodontal disease. You will take a spit test and the lab will return the results to our office within 24 to 48 hours. The doctor will prescribe the appropriate antibiotic based on the lab’s bacteria profile. For more advanced cases, a surgical treatment known as flap surgery may be necessary to help the surrounding tissues reattach to the teeth. The procedure involves creating flaps to pull back the gum tissues so the doctor can remove diseased tissue and fully clean and smooth the root surfaces. After cleaning out the infection, the doctor will suture the gum tissues so they are tighter around the teeth than before, making it difficult for bacteria to reattach themselves in the gum pockets. One of the effects of periodontal disease is gum recession. Dr. Sigafoos may perform gum grafting to strengthen and augment thin or receded gums to help protect the underlying bone and prevent further gum recession. He may also use gum grafts to cover already exposed tooth roots and protect them from further exposure. Grafting can also be done to improve the cosmetic appearance of a patient’s smile. During gum grafting, the doctor removes a small amount of tissue from other parts of the patient’s mouth and attaches it to the affected gumline. Donor tissue may also be used. In cases where periodontitis has led to bone defects around the root of the tooth, Dr. Sigafoos may perform bone grafting to regenerate new bone and help prevent tooth loss. He places donated bone tissue in the area of missing bone and protects it by covering it with a collagen membrane which will eventually dissolve and be absorbed by the body. Gum disease should be treated right away before the condition worsens and causes irreversible damage. Anxiety shouldn’t stand in the way of getting the dental care you need. We offer sedation to patients who are anxious about treatment, especially in the case of longer, more complex procedures. The sedation options we offer are nitrous oxide, oral sedation and IV sedation (under the supervision of a licensed anesthesiologist).